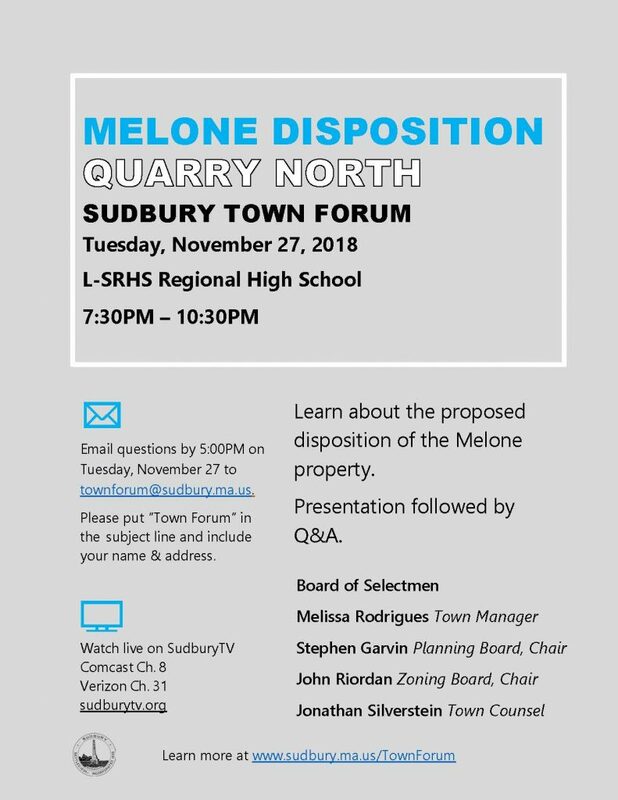 The Town Forum on Quarry North and Melone Disposition was held on Tuesday, November 27, 2018 from 7:30pm – 10:30pm at L-SRHS Auditorium. 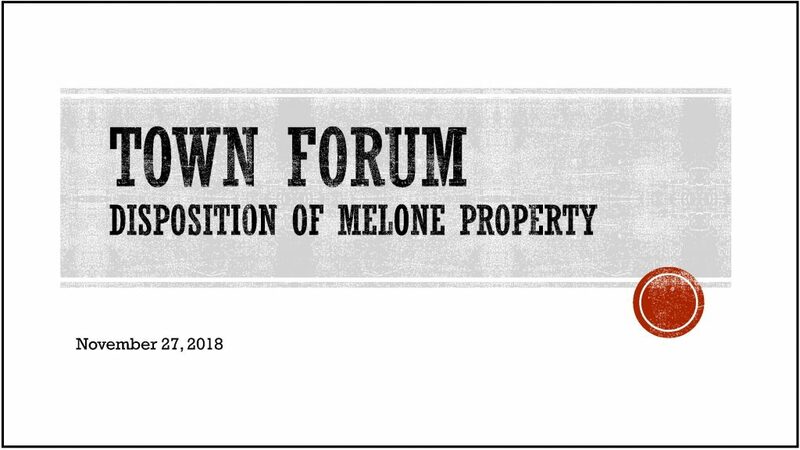 The Forum provided residents with an opportunity to ask questions and learn more about the proposed disposition of the Melone property. The Video of the forum can be viewed on demand at SudburyTV.org. A Presentation by Town Manager Melissa Murphy-Rodrigues on the history of the property and the proposed disposition will be followed by a Q&A. QUESTIONS were taken live in the hall on the night of the Forum and in advance via email up until 5:00PM on 11/27/18. Those wishing to submit questions in advance, may email questions to [email protected]. Please put “Town Forum” in the subject line and include your name and address. TRANSPORTATION: The Senior Center will have a van available for those who need transportation to the Town Forum. The handicapped-accessible van can accommodate up to 9 people, including wheel chairs. To sign up or learn more, please call the Senior Center at 978-443-3055 by Monday, November 26 at 4:00PM. BROADCAST: The forum will be broadcast on SudburyTV and will be made available to view OnDemand. The Board of Selectmen consists of five members - each elected for a three-year term. They serve without compensation. The Selectmen act as the primary policy-making body of the Town. They provide oversight for matters in litigation, act as the licensing authority for a wide variety of licenses, and enact rules and regulations for such matters as traffic control. Further, the Board serves, along with the Town Treasurer, as Trustees of Town Trusts. Staff in the Selectmen's Office accept articles for Town Meeting, prepare Town Meeting Warrants and produce the Town's Annual Report. Staff also serve as liaison between the public and the Board, handle all phone calls, visitors and correspondence directed to the Office and maintain all records of Board of Selectmen's meetings. They also maintain the database of all Boards and Committees appointments and resignations.